Scott Snyder gravitates toward telling horror stories and Wytches might be his best yet. In books like The Wake and American Vampire Snyder has dual goals with the story (a sci-fi second half and a journey through American history, respectively). 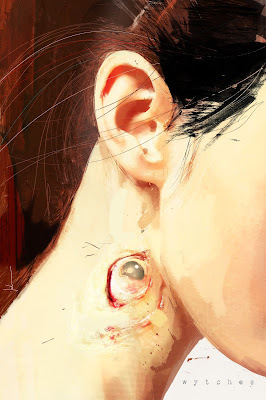 So far, Wytches has a focus to its horror that those other books lack. Wytches #2 unfortunately doesn’t give many answers about the mysterious beings in the woods, but it does ratchet up the creep out factor significantly. Each of the three storylines being followed starts out mundane: a father building a bannister chair, a mother adjusting to work after being disabled, and a girl swimming in gym class. Slowly but surely each character begins to be unsettled for various reasons, and you along with them, until each one gets a chilling “To Be Continued” moment. This wouldn’t work at all without Jock’s art and Matt Hollingsworth’s colors. Jock’s jagged, jerky style does an excellent job of keeping you off guard. Whenever the woods are in panel I had to check closely to see if it was just trees or if a wytch was lurking in the shadows. Hollingsworth perfectly times color transitions between warm greens and yellows for everyday life to the reds and purples of the more supernatural panels. We get our best look at the wytches so far toward the end of the issue, and their design was genuinely disturbing to me, in the best way. Wytches #2 continues the slow build of this series for the bulk of the issue, but by the end we’re set up for what should be a scary ride as it continues. While I’d love to know more about the wytches, I can’t be disappointed in an issue that sells its horror as effectively as this does.